Today I was planning on posting the poll results but with Saturday being Koninginnedag — Queensday in English — here in the Netherlands, I couldn't pass up the opportunity to post a few photos of this event. Queensday is officially a celebration of the birth of the Queen of the Netherlands. Though the flag of the Netherlands is red, white and blue (and the oldest national tricolor flag still in use), the color orange is widely seen on Queensday, honoring the House of Orange-Nassau, the Queen's family. This city of less than a million people doubles in population for a day when people come to Amsterdam to celebrate, dance, drink (and smoke) and enjoy their role in a country-wide celebration. 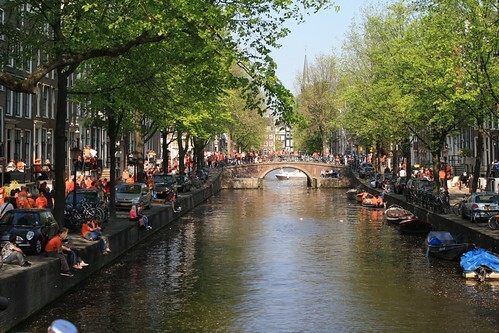 Not every place in Amsterdam is a complete madhouse, but even those places have orange-clad revelers lining the streets. When you need a break, it's nice to find one of these spots to relax. 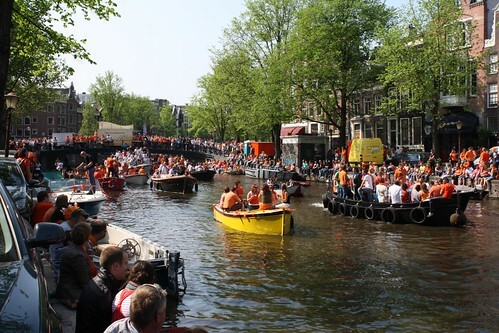 Amsterdam police reported that there were very few problems on Queensday, but I'm not surprised. There are sometimes incidents, but Amsterdam is a very peaceful, friendly city. If you'd like to see more, I have a larger photo set on Flickr.